A speedy but special supper for two that only takes minutes to prepare and cook. Serving salads warm really brings out the flavour of the ingredients and they're perfect for colder weather. Place the potatoes in a pan of boiling water and cook for 10-15 minutes or until tender, drain and keep warm. To make the dressing, mix together 4tbsp of the oil, the vinegar and shallot, season to taste and leave to one side. In a large frying pan, cook the lardons until crisp and golden, drain on kitchen paper and add to the cooked potatoes and keep warm. In the same frying pan heat the remaining olive oil, add the sliced chicken and cook for 4-5 minutes until golden brown and thoroughly cooked. 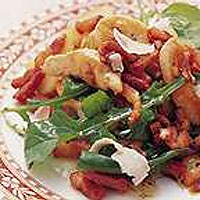 Place the cooked chicken into a large bowl with the potato and the bacon, add the dressing and rocket, then toss gently. Divide the mixture between two plates, top with the Parmesan and drizzle any remaining dressing over the salad and around the plate. Serve with warm Waitrose Rustic Bread. Do not add the rocket to the salad until you are just about to serve so that it stays fresh and crisp. Instead of grating the Parmesan, make shavings using a potato peeler.